Ian and Brian Scott at Pakarau Farm last month, with The Homestead and the Keith Hay home in the background. About 200 relatives and friends of the Scott family of Pakarau Farm, Ngarua, came together last month to celebrate the centenary of the piece of land their ancestors tamed from wild New Zealand terrain into the dairy farm it is today. The story of the direct line of the Scott family in NZ starts in 1913, when Robert Scott, aged 52 at the time, and his wife, Jane (née Lockhart), at age 49, emigrated from Lesmahagow, Scotland, with their 10 children. Thwarted from owning a farm in the Scottish land ownership system, they bought the Ngarua farm that was to be known as ‘The Ranch’, in October 1913. Robert and Jane, with their five daughters and five sons – Bob, Jack, Bill, Tom and Hugh – became a well-known and respected family in the district. When World War I broke out, Bob, Jack and Bill went to Europe. Sadly, only Jack and Bill returned and started farming on land their father Robert had secured for them while they were away at war. Bill settled on land opposite Ngarua school, and Hugh worked on The Ranch, buying it after his father’s death. Descendant, Brian Scott, who lives on the property today, remembers many stories, both first-hand and from relatives, over the years. “It was my grandfather, Jack, who settled on the land that became known as Pakarau Farm,” says Brian. While the other three Scott farms were sold over the years, Jack’s Pakarau Farm has been in his line of Scotts since 1919. In 1919, the then single Jack literally broke in his farm, which is recorded as having three-quarters of an acre of grass and the rest swamp and tea tree. He cleared and drained the land, and built the first house on the property, which is now a worker’s cottage. In his first year he milked 12 Jersey cows, a breed which is still traditionally milked on the farm. Jack married Taranaki-born Jessie Vickers in 1925 and they had six children between 1926 and 1937, four boys and two girls, including twins Douglas and Thomas. This family built the second house on the property, the 1930s weatherboard home, fondly known as ‘The Homestead’, and raised their children there. From the 1920s, the farm sent its milk to the NZ Dairy Co. factory at Waitoa. Ngarua was the first area to have milk collected by tanker. Pakarau was one of 11 farms chosen by the NZ Dairy Co. to have milk collected by tanker in a pilot scheme. Douglas stayed and sharemilked on Pakarau farm. He married Joan Fausett in 1956. Douglas and Joan are Brian’s parents, and they moved into the third house put on the property. Grandfather Jack passed away in 1961 and Granny Jessie remained there for another 10 years. Douglas bought Pakarau from his family in 1966. Brian remembers moving up to The Homestead at age 12. Brian, a collector himself, remembers the first tractors on the farm that were used throughout his childhood. Douglas was a NZ Dairy Co. committee member for Ngarua District for 10 years in the 1970s. Under Douglas, the farm tried several ventures in the 1980s, including an acre of blueberries, and growing maize seed for Pioneer Yates. Douglas oversaw Pakarau until his death in October 2017. 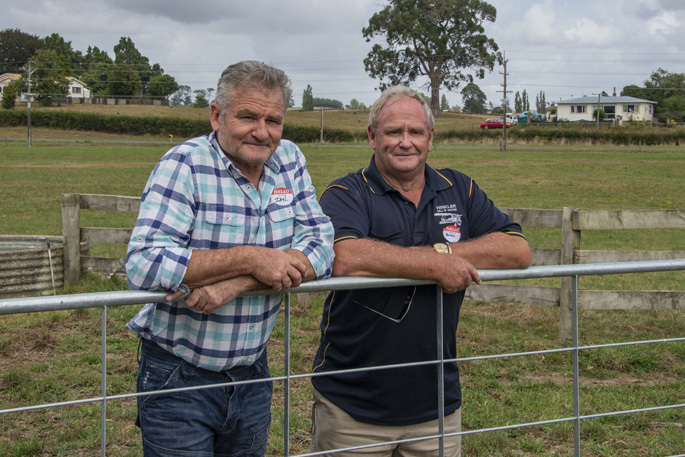 After the probate process his sons, Brian and Ian, took over as the Pakarau Farm Partnership. Ian remains in Melbourne, where he’s worked in the corporate world since 1996. Brian, a retired tanker driver from Fonterra Waitoa, lives on the farm with his second wife Shirley in a modern home built in 2007. Brian oversees their sharemilker, and assists with repairs and maintenance. The modern farm totals 70ha, and milks 230 hypo-immune vaccinated Jersey cows in the updated 1966 16-aside herringbone cowshed. The special milk is collected for Fonterra’s Stolle Milk production. The farm is in good shape, and fully compliant with Waikato Healthy Rivers Plan. “The Waitoa River is very clean, with sandy beaches, a swimming hole, and freshwater eels and crayfish have returned,” says Brian.